The active little Downy Woodpecker is a familiar sight in parks and woodlots, where it joins flocks of chickadees and nuthatches, barely outsizing them. An often acrobatic forager, this black-and-white woodpecker is at home on tiny branches or balancing on slender plant galls. 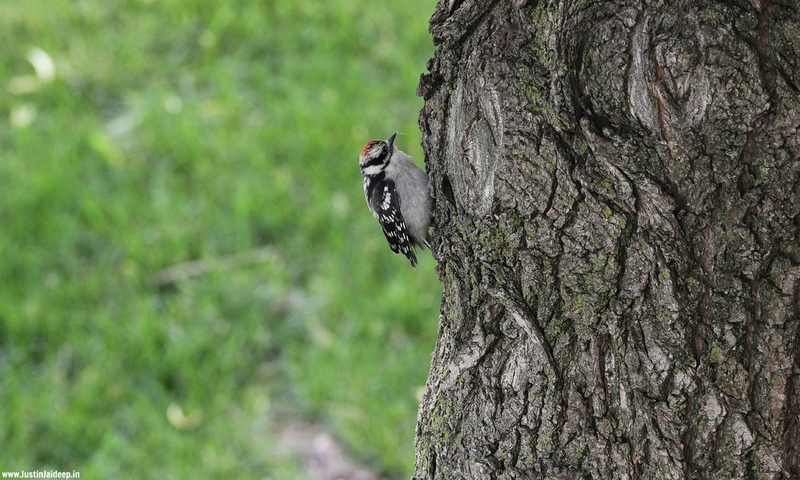 Downy Woodpeckers are small versions of the classic woodpecker body plan. 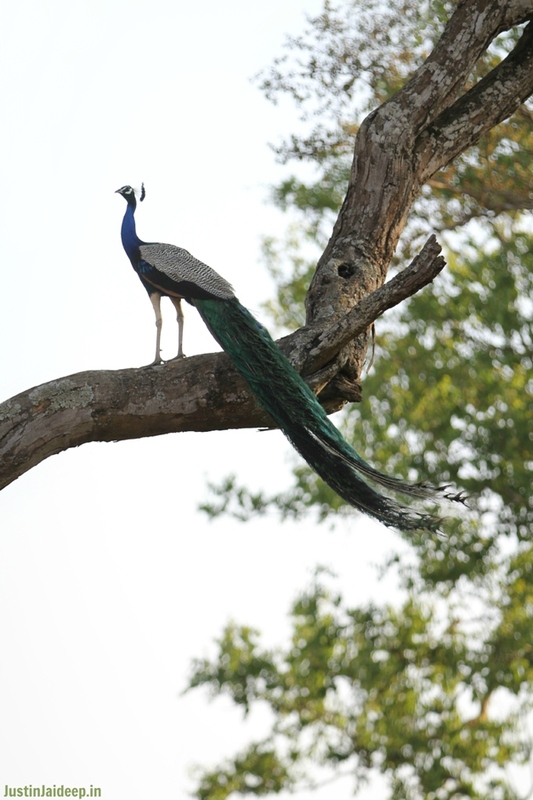 They have a straight, chisel-like bill, blocky head, wide shoulders, and straight-backed posture as they lean away from tree limbs and onto their tail feathers. 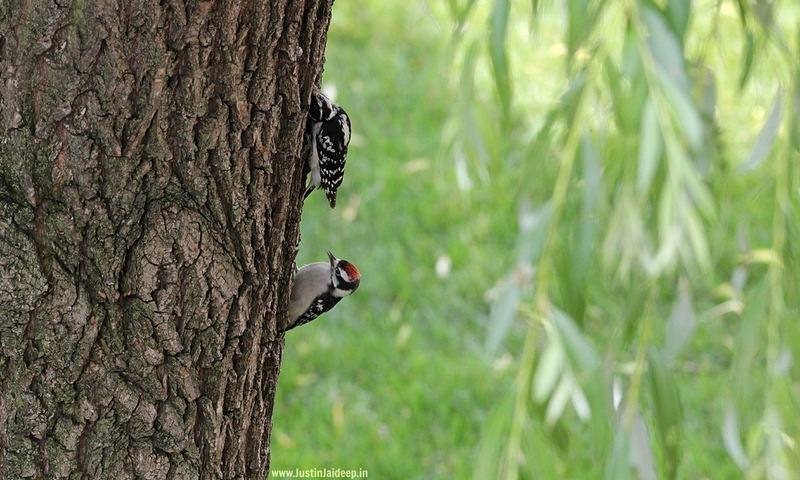 The bill tends to look smaller for the bird’s size than in other woodpeckers. 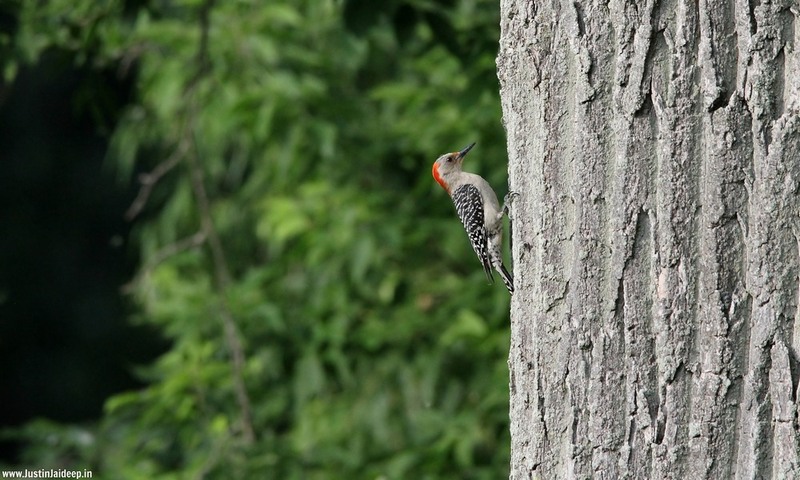 Downy Woodpeckers hitch around tree limbs and trunks or drop into tall weeds to feed on galls, moving more acrobatically than larger woodpeckers. Their rising-and-falling flight style is distinctive of many woodpeckers. In spring and summer, Downy Woodpeckers make lots of noise, both with their shrill whinnying call and by drumming on trees. You’ll find Downy Woodpeckers in open woodlands, particularly among deciduous trees, and brushy or weedy edges. They’re also at home in orchards, city parks, backyards and vacant lots. 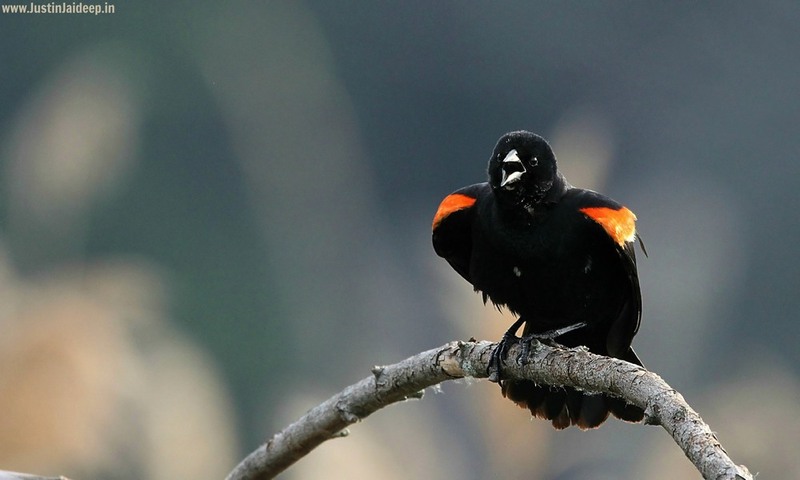 One of the most abundant birds across North America, and one of the most boldly colored, the Red-winged Blackbird is a familiar sight atop cattails, along soggy roadsides, and on telephone wires. Glossy-black males have scarlet-and-yellow shoulder patches they can puff up or hide depending on how confident they feel. Females are a subdued, streaky brown, almost like a large, dark sparrow. In the North, their early arrival and tumbling song are happy indications of the return of spring. A stocky, broad-shouldered blackbird with a slender, conical bill and a medium-length tail. Red-winged Blackbirds often show a hump-backed silhouette while perched; males often sit with tail slightly flared. Male Red-winged Blackbirds are hard to mistake. They’re an even glossy black with red-and-yellow shoulder badges. Females are crisply streaked and dark brownish overall, paler on the breast and often show a whitish eyebrow. Male Red-winged Blackbirds do everything they can to get noticed, sitting on high perches and belting out their conk-la-ree!song all day long. Females stay lower, skulking through vegetation for food and quietly weaving together their remarkable nests. In winter Red-winged Blackbirds gather in huge flocks to eat grains with other blackbird species and starlings. 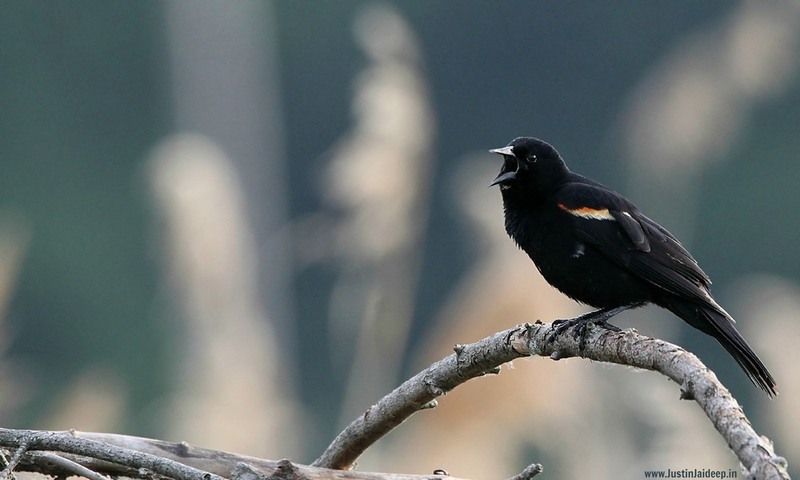 Look for Red-winged Blackbirds in fresh and saltwater marshes, along watercourses, water hazards on golf courses, and wet roadsides, as well as drier meadows and old fields. In winter, you can find them at crop fields, feedlots, and pastures. The Cedar Waxwing is a silky, shiny collection of brown, gray, and lemon-yellow, accented with a subdued crest, rakish black mask, and brilliant-red wax droplets on the wing feathers. In fall these birds gather by the hundreds to eat berries, filling the air with their high, thin, whistles. In summer you’re as likely to find them flitting about over rivers in pursuit of flying insects, where they show off dazzling aeronautics for a forest bird. The Cedar Waxwing is a medium-sized, sleek bird with a large head, short neck, and short, wide bill. Waxwings have a crest that often lies flat and droops over the back of the head. The wings are broad and pointed, like a starling’s. The tail is fairly short and square-tipped. Cedar Waxwings are pale brown on the head and chest fading to soft gray on the wings. The belly is pale yellow, and the tail is gray with a bright yellow tip. The face has a narrow black mask neatly outlined in white. The red waxy tips to the wing feathers are not always easy to see. 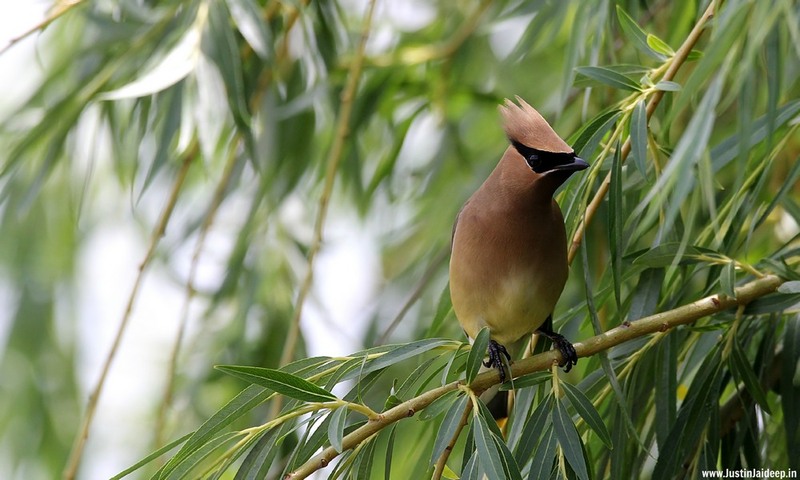 Cedar Waxwings are social birds that you’re likely to see in flocks year-round. They sit in fruiting trees swallowing berries whole, or pluck them in mid-air with a brief fluttering hover. They also course over water for insects, flying like tubby, slightly clumsy swallows. Look for Cedar Waxwings in woodlands of all kinds, and at farms, orchards, and suburban gardens where there are fruiting trees or shrubs. This common, large songbird, with its perky crest; blue, white, and black plumage; and noisy calls. Blue Jays are known for their intelligence and complex social systems with tight family bonds. Their fondness for acorns is credited with helping spread oak trees after the last glacial period. Large crested songbird with broad, rounded tail. Blue Jays are smaller than crows, larger than robins. White or light gray underneath, various shades of blue, black, and white above. 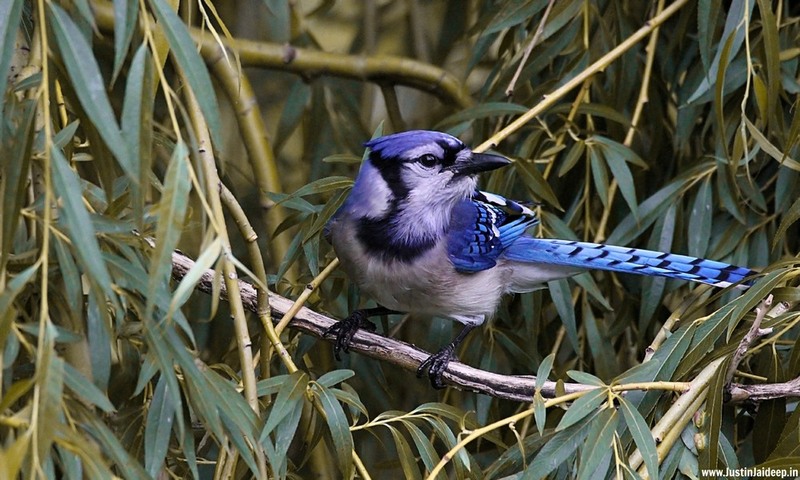 Blue Jays make a large variety of calls that carry long distances. Most calls produced while the jay is perched within a tree. Usually flies across open areas silently, especially during migration. Stuffs food items in throat pouch to cache elsewhere; when eating, holds a seed or nut in feet and pecks it open. Blue Jays are birds of forest edges. A favorite food is acorns, and they are often found near oaks, in forests, woodlots, towns, cities, parks. The male Northern Cardinal is perhaps responsible for getting more people to open up a field guide than any other bird. They’re a perfect combination of familiarity, conspicuousness, and style: a shade of red you can’t take your eyes off. Even the brown females sport a sharp crest and warm red accents. Cardinals don’t migrate and they don’t molt into a dull plumage, so they’re still breathtaking in winter’s snowy backyards. In summer, their sweet whistles are one of the first sounds of the morning. The Northern Cardinal is a fairly large, long-tailed songbird with a short, very thick bill and a prominent crest. Cardinals often sit with a hunched-over posture and with the tail pointed straight down. Male cardinals are brilliant red all over, with a reddish bill and black face immediately around the bill. Females are pale brown overall with warm reddish tinges in the wings, tail, and crest. They have the same black face and red-orange bill. Northern Cardinals tend to sit low in shrubs and trees or forage on or near the ground, often in pairs. 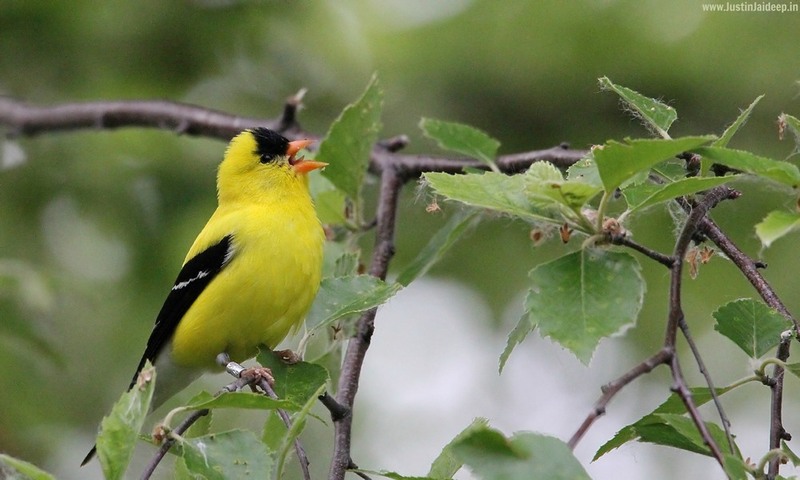 They are common at bird feeders but may be inconspicuous away from them, at least until you learn their loud, metallic chip note. 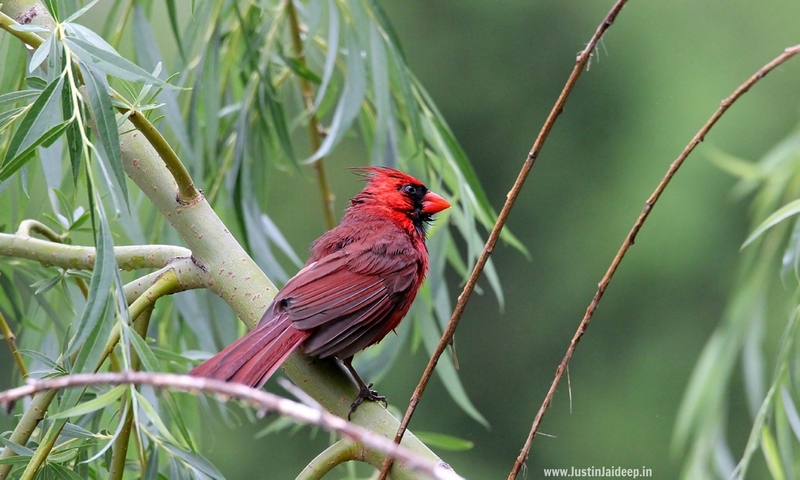 Look for Northern Cardinals in inhabited areas such as backyards, parks, woodlots, and shrubby forest edges. Northern Cardinals nest in dense tangles of shrubs and vines. The House Finch is a recent introduction from western into eastern North America (and Hawaii), but it has received a warmer reception than other arrivals like the European Starling and House Sparrow. That’s partly due to the cheerful red head and breast of males, and to the bird’s long, twittering song, which can now be heard in most of the neighborhoods of the continent. House Finches are small-bodied finches with fairly large beaks and somewhat long, flat heads. The wings are short, making the tail seem long by comparison. 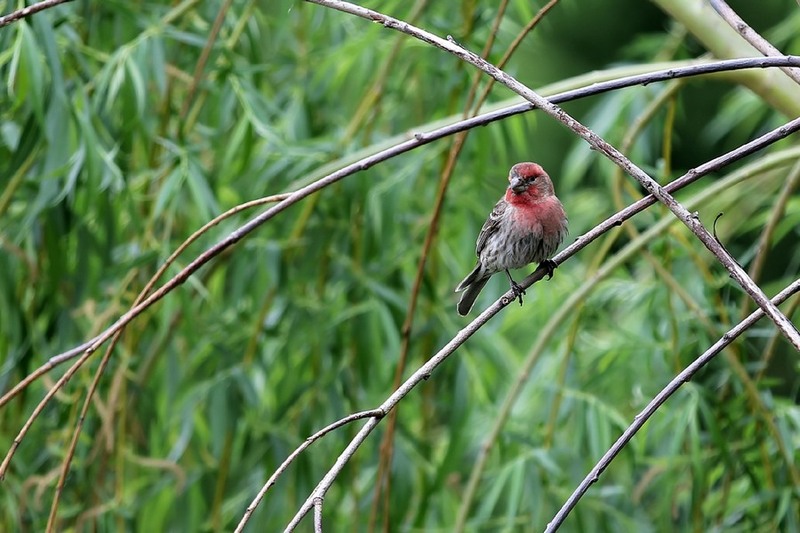 Many finches have distinctly notched tails, but the House Finch has a relatively shallow notch in its tail. Adult males are rosy red around the face and upper breast, with streaky brown back, belly and tail. In flight, the red rump is conspicuous. Adult females aren’t red; they are plain grayish-brown with thick, blurry streaks and an indistinctly marked face. House Finches are gregarious birds that collect at feeders or perch high in nearby trees. 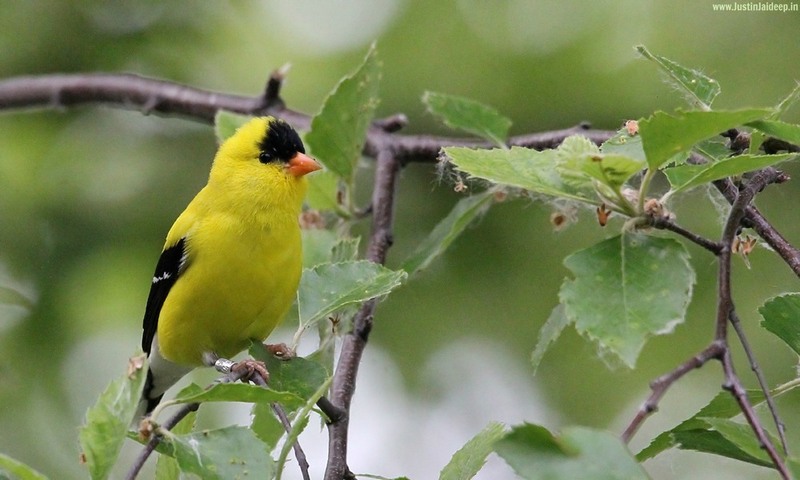 When they’re not at feeders, they feed on the ground, on weed stalks, or in trees. They move fairly slowly and sit still as they shell seeds by crushing them with rapid bites. Flight is bouncy, like many finches. 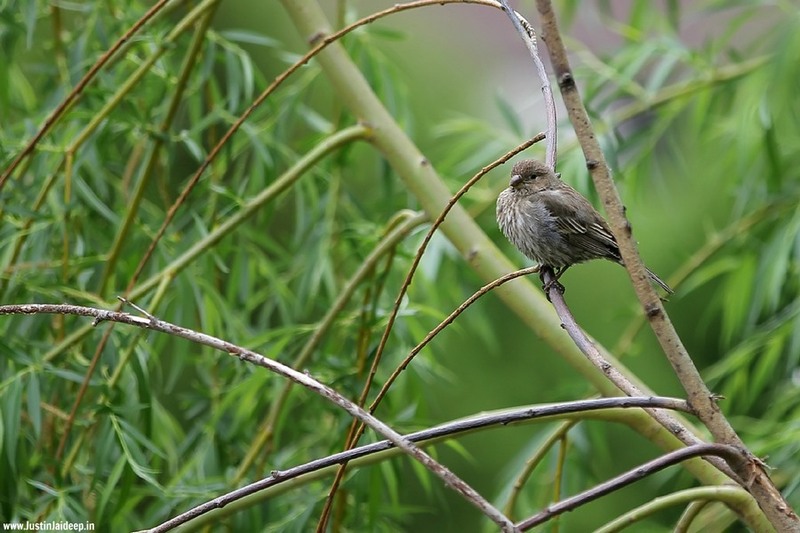 House Finches frequent city parks, backyards, urban centers, farms, and forest edges across the continent. In the western U.S., you’ll also find House Finches in their native habitats of deserts, grassland, chaparral, and open woods.